While in high school in the mid 1970s Tom Lyle assembled in his parent's basement his first "real" stereo system. It consisted of a pair of McIntosh MC-30 power amplifiers, a homemade preamplifier, an inexpensive Garrard turntable with an Empire cartridge, and a pair of homemade speakers with a single 15-inch woofer and a horn. In his spare time, besides listening to his system, he played guitar in a garage rock band which had few fans outside their small circle of friends. Tom also worked part-time for an audio installation company that did work in nursing homes, skating rinks, multi-room systems in homes, and the like. He spent a great deal of time on the job smashing holes in plaster walls with a sledge hammer, snaking wires through walls, and honing his soldering skills whilst in contorted positions. Overlapping with the installation job was a job as a stereo salesman at a local chain that continued well into his college years (as a biology major, oddly). 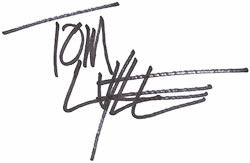 After he graduated, Tom joined a promising rock band as their bass player, and then switched to guitar about six months later. The band kept him very busy both on the road and in the studio during the 1980s. They did a lot of touring, so Tom was able to do a good deal of record shopping, but upgrades to his current stereo system were rare — although it hardly mattered since he wasn't home very much and spent all of his spare money on band equipment (and records). In 1989 he facilitated the group's break-up because of quite a few things; but he said the main reason was that he grew tired of the schedule, especially touring. Despite many releases and multiple tours of North America and Europe, the band didn't come close to attaining mainstream success — when one enters "Tom Lyle" into an internet search engine, one gets many more hits regarding the DC and Marvel Comics artist who shares his name. Tom then used the cash he got from selling his Marshall stacks as seed money to begin building a more serious home stereo system, a home recording studio, and to buy more records. He was rather enjoying settling into a more stable home life and enjoying working behind the scenes rather than being a part of it. A short time later he started writing for The Sensible Sound, and also started working part-time in Herb Papier's machine shop helping in a (very) small way to fabricate parts for the Tri-Planer tonearm (then called the Wheaton Triplanar). Tom claimed "my favorite thing about spending time with for Herb was our serious listening sessions, with little conversation regarding audiophile matters. Yet those topics were impossible to ignore given that we were listening to music on Herb's superbly assembled, massive system." Currently, his main system is built around a Basis Debut turntable (with a Tri-Planar 'arm, naturally). More than 60 percent of his serious listening is via vinyl. He says he has nothing against digital; his studio is digital, he has a huge CD collection, many terabytes of music on a hard drive and a loaded digital audio player. 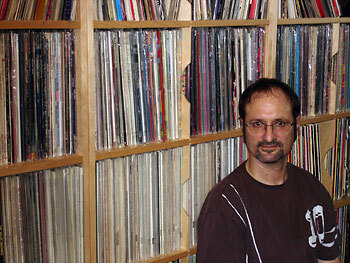 The only reason that his record and CD collection is so large (he rationalizes) is that his taste in music (or lack thereof), is all over the map — including, but certainly not limited to, late 1950s to early 1970s jazz, all eras of electronic music, classical music from the late 18th century to the present, and all types of rock. As Tom gracefully ages, his musical tastes (or lack thereof) pile up on one another. In other words, he still listens to music that he discovered when he was 14 years old, never discarding that and adding to the mix. They say people's taste in music changes over the years, Tom Lyle's only accumulates. Audioquest and VPI record brushes to apply pre-cleaner and homemade record cleaning fluid.